While it may be true that nuts are high in fat and calories, research continues to show that they are nutritional gems. Adding a moderate amount of nuts into your diet may be one way to keep your heart healthy and your health at its best. Researchers used information from the National Health and Nutrition Examination Survey (NHANES) to study the connection between nut consumption and health in 13,292 adults, 19 years and older. They analyzed diet, other health habits, and markers of cardiovascular wellness, including blood pressure, waist circumference, height and weight, HDL (“good”) cholesterol, and fasting glucose (blood sugar), to look for links between nuts and improved health. Approximately 19% of adults 19 to 50 years old, and 21% of adults 51 years and older regularly consumed nuts. Nut consumers had a lower BMI, 27.7 on average, versus an average BMI of 28.1 for non-nut eaters. Nut consumers had significantly smaller waist circumference measures, 37.6 inches on average, versus a 40-inch waist circumference for those who didn’t eat nuts. Tree nut consumers weighed less—an average of 174 pounds—compared with non-consumers, who weighed 178 pounds. Nut consumers were significantly less likely to have high blood pressure, abdominal obesity, high fasting glucose levels, and low HDL-cholesterol levels. Don’t fear fat. Nuts are high in fat and calories, but it’s healthy fat. Plus, studies consistently show that people who eat nuts are thinner than those who don’t, so there’s no reason to fear nuts because of their fat content. Eat ‘em early. Add nuts into your first meal of the day. 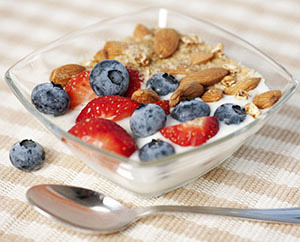 Sprinkle a small handful of almonds, walnuts, cashews, pecans, or any nut you like into cereal, oatmeal, or yogurt. Snack smart. Nuts are portable, and very satisfying. They fill you up, which may be one reason why people who eat them tend to be thinner. Carry a small baggie of nuts and dried fruit for an on-the-go pick-me-up. Sprinkle in salad. Any type of salad can be tastier with a few nuts. Add them to fruit salads, green salads, or even tuna and chicken salads. Nosh nut butters. Branch out from the usual peanut butter. Try almond butter, cashew butter, or other nut butters for a tasty treat.